Waterloo North Chiropractic & Massage cares about helping you and your family feel better. Whether you’re looking for pain relief or enhanced wellness, we will work with you to reach your goals and get the most out of life! We have a team of health care practitioners who provide a comprehensive collection of therapies to enhance your well being. We gladly welcome individuals, children, families and pregnant patients too! Chiropractic & Registered Massage Therapy services are available Monday to Saturday. Reflexology, holistic nutrition counselling, and Iridology are also offered. You can now book your massage therapy appointments online. 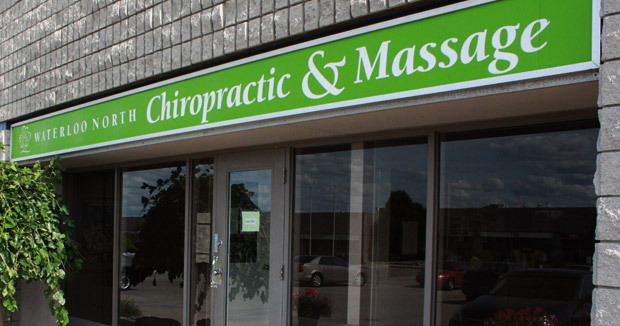 To book chiropractic care, same day services, or other services please call the clinic at 519-746-3838. We are conveniently located at the corner of Parkside Drive and Weber Streets in North Waterloo, close to the expressway for easy access. It’s up to you to take the first step towards feeling better – call us today!